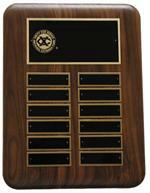 10” x 7” brass metal inlay, walnut finish, engraving plate included (3” x 5”). 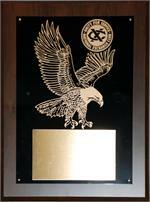 16” x 11” with ¾” x 6” engraving plate. 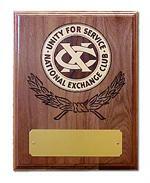 9” x 7” with laser engraved emblem, walnut finish, engraving plate included (1 ½” x 5”). 9” x 12” walnut with 12 black brass plates. 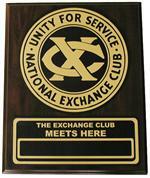 Header plate includes lasered Exchange Club emblem. ***Special Order Item-please allow 2-3 weeks for delivery. 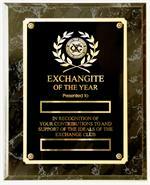 7” x 9” plaque with brass plate. 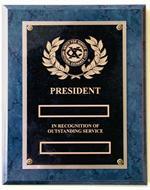 Inexpensive and attractive way to honor those club or district officers, chairpersons, club supporters, teachers, community members, etc. 9” x 7” walnut finish. 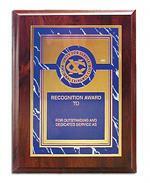 Plaque states: Recognition Award to ( ) for outstanding and dedicated service as ( ).